Burford is one of the most picture-perfect of Cotswolds villages, with the long and wide High Street sloping down to the River Windrush, flanked on both sides by beautifully preserved medieval buildings of honey-coloured Cotswold stone. 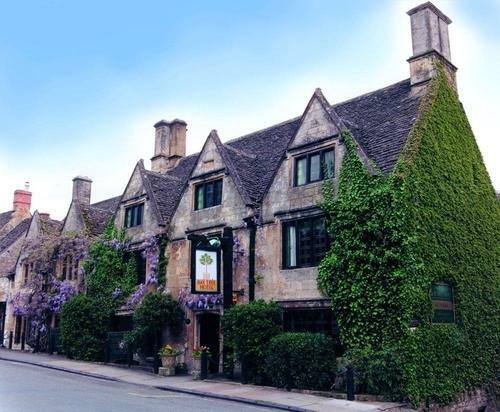 The Bay Tree in Burford has welcomed visitors since 1565, when it was the country home of the Chief Baron of the Exchequer to Elizabeth I. The reception rooms are oak-beamed and flagstoned and include an impressive raftered hall. Beyond, an oak staircase leads to the luxurious bedrooms, each having individual character and decorated in warm traditional colours with fine, often antique, furniture for a true country feel. The Woosack Bar offers delicious light meals, and the award-winning Bay Tree Restaurant the finest in traditional and modern English cooking with an extensive wine list in an intimate, candle-lit atmosphere. In summer, the terraced garden at the back is a sun-trap, shielded by Cotswold stone walls, trees and flowering shrubs - a delightful place to take coffee after lunch or a scone with afternoon tea. Stepping through the wisteria at the front door, you set out on an enchanted journey through the centuries; once made, never forgotten.